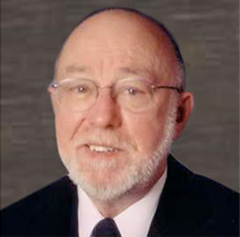 " It’s quality of life "
Dr. Ronald Miller, Emeritus, started Miller Orthopaedic in 1972 as an independent practitioner. His specialties included orthopedic trauma, hand injuries and total joint replacement of the knee, hip and shoulder. As a board certified orthopedic surgeon, he was on the design team for DePuy’s new P.F.C. Sigma Rotating Platform Mobile Bearing Knee. This knee replacement device offered younger patients who needed surgery the opportunity to have the procedure where it previously could not be done. Dr. Miller grew up and graduated from Clarinda High School. He pursued his bachelors and doctorate degree in medicine from the University of Iowa. He completed his orthopedic internship at Gorgas Hospital in the Panama Canal Zone. His two residencies were completed at Northwestern University in Chicago, Illinois and Allegheny General Hospital in Pittsburgh, Pennsylvania. Dr. Miller built his practice in Omaha and Council Bluffs with hard work and by providing his patients excellent care. He expanded his practice over the years by adding additional orthopedic specialists to round out the practice in providing total orthopedic care for Southwest Iowa and Nebraska. With his departure from the practice in 2007, there were four orthopedic specialists and one podiatrist. Miller Orthopedic Specialists has now grown. See our list of doctors, physical therapists, and more here. Make an appointment today to experience our patient-centered care for your self. © Copyright 2019 Miller Orthopedic Specialists, All rights reserved.